I love playing around with recipes. Once I find something that really works, I post it on here. 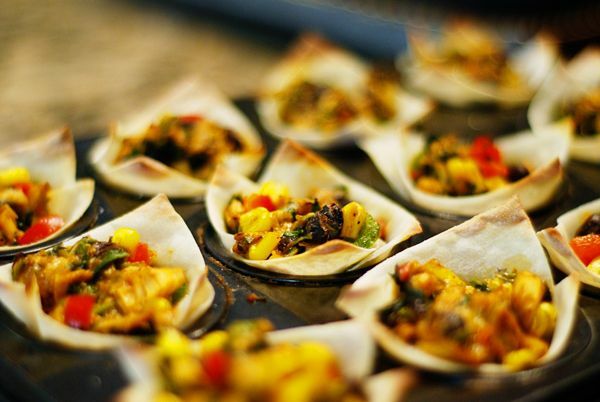 But often, if I really like something, I'll tweak it to make it really work for party food. 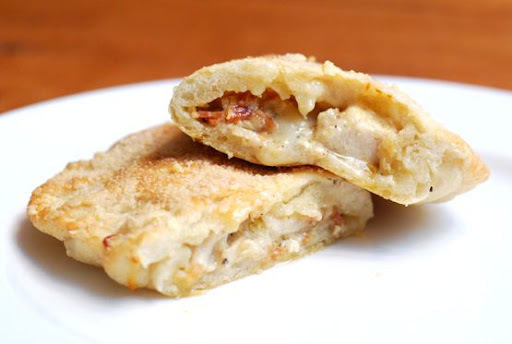 Like these Chicken Bacon Caesar Calzones. These are so delicious and one of my favorite recipes. 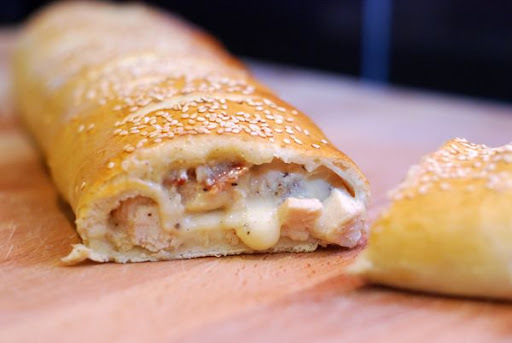 But, Chicken Bacon Caesar Stromboli was born out of my need to simplify it so that I could make larger batches of it for parties. 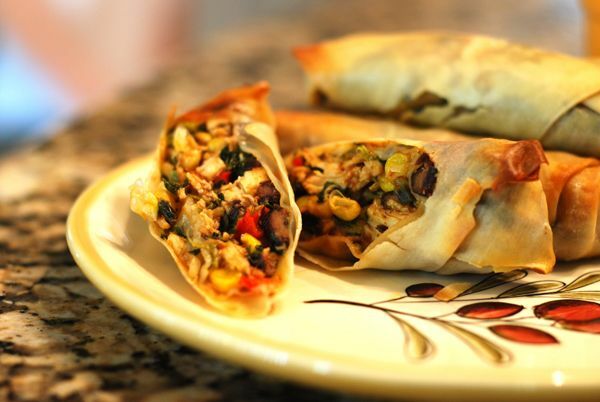 They are wonderfully delicious, terribly addicting, out-of-this-world-yummy Southwestern Eggrolls. 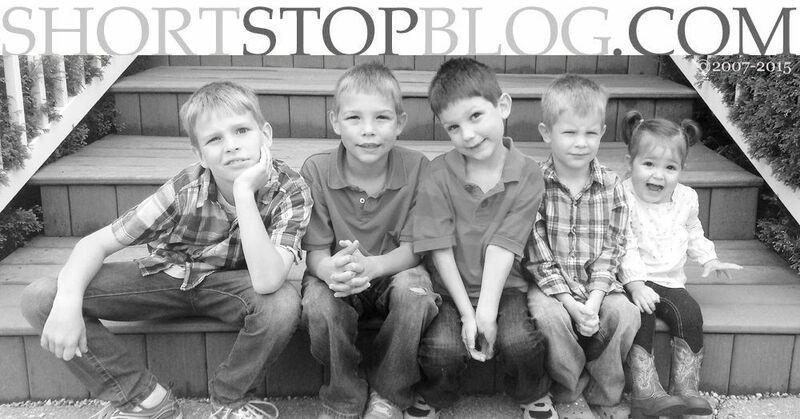 Some of you have made them and loved them and they are a huge hit with my family and friends. I love making them. The filling is easy to throw together and I love rolling them up, baking a few, and throwing the rest in the freezer for later that day another day. But, inevitably, I end up with some leftover filling. Even if I stuff the eggrolls full, I always have filling leftover. It's never enough for another pack of eggroll wrappers, but it's more than just a few spoonfulls to gobble up out of the pot. 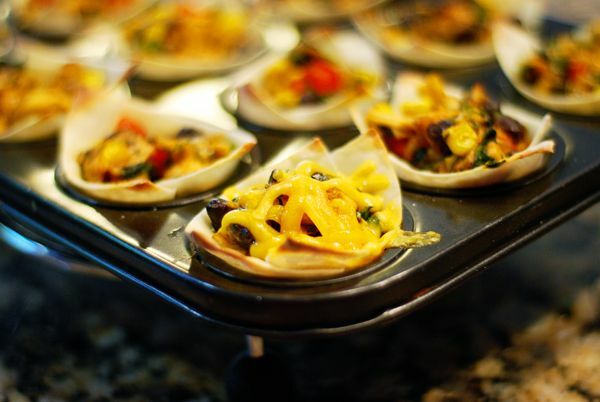 OR, I want dozens of mini-appetizers, not a platter full of eggrolls. 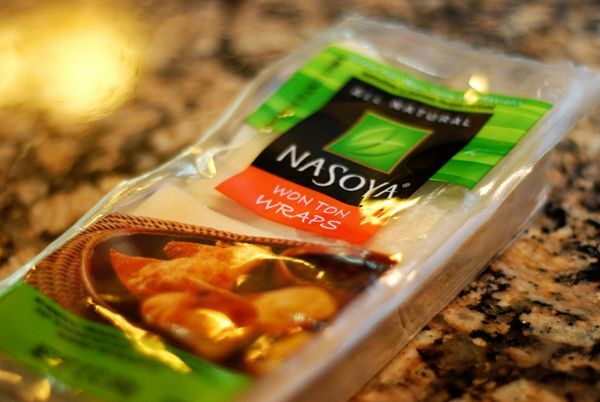 These are wonton wraps. They are just mini versions (same ingredients) of the eggroll wrappers I use for the Southwestern Eggrolls. They would normally be stuffed with a Chinese-style filling, then closed up into wontons. 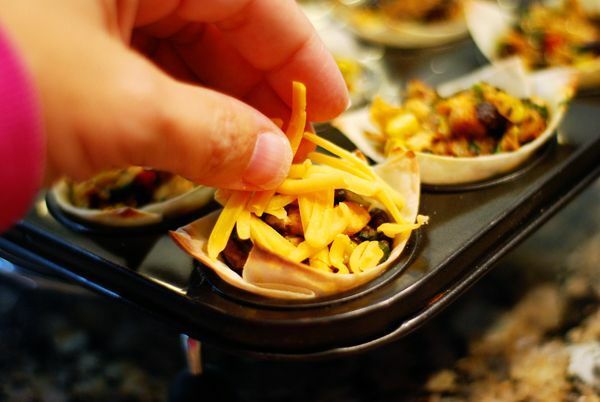 But, they make perfect little bite-sized appetizer cups. Tons of them. 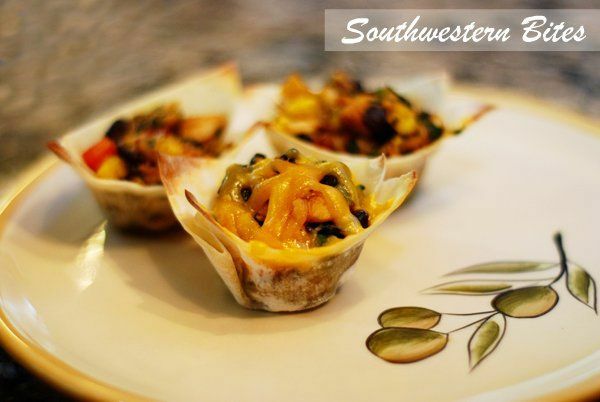 And, they are perfect for any leftover Southwestern Eggroll filling. 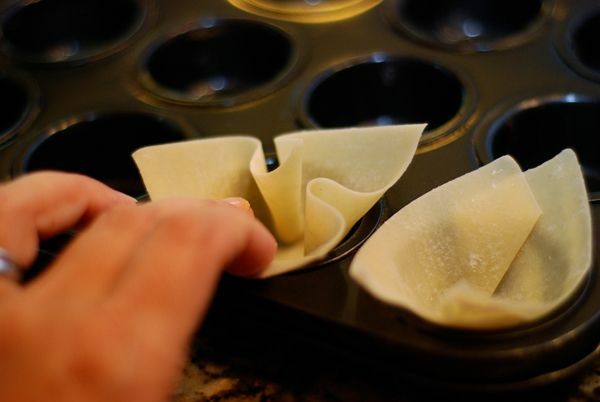 Place a wonton wrap into each of the sections. 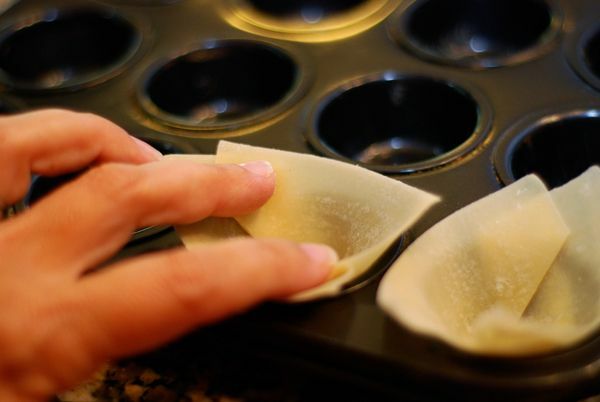 Using your fingers, gently press the wrap against the bottom and sides. Here are two finished ones ready to be filled. Using a spoon, fill each cup with a heaping tablespoon of filling. Here they are ready to go into the oven. Bake for 5 minutes. YES, just 5 minutes! When they are finished, the corners of the cups are golden brown and crispy and the cup is perfectly cooked and molded into shape! Now, being a girl who LOVES cheese, I topped a few of them with sharp cheddar. My husband likes them without the extra cheese (there is already cheese in the filling), but I say you can NEVER have too much cheese. SO, I placed a small amount of cheddar on top, and baked them for 1 more minute. I think we look pretty good together, don't you? 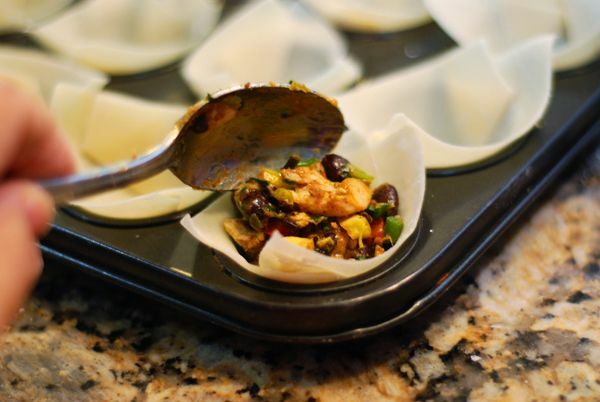 If you need a bunch of little appetizers for a party (Super Bowl? ), these are perfect. You could easily make 100 of these out of the batch of filling below. Top them with a dab of sour cream, salsa, or Amy's Cilantro Cream Sauce. Or just serve little bowls of dips next to a big platter of these. 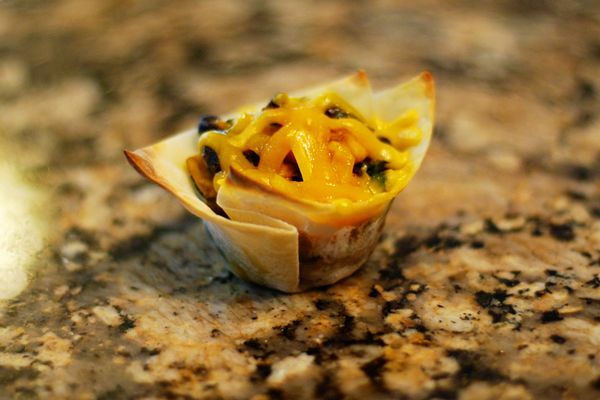 I've been thinking that these little cups would be perfect for all sorts of fillings. Gonna play with them and see what I can come up with! In the meantime, try these! They're so quick to pull together. No rolling into eggrolls. No brushing with oil. If you can fill muffin tins, you can make these. And, I know you'll love' em! Heat 2 tablespoons vegetable oil in a medium/large saucepan or pot over medium heat. Stir in green onion and red pepper. Cook and stir 5 minutes, until tender. Dice chicken and mix into the pan with onion and red pepper. Mix in frozen corn, black beans, spinach, jalapeno peppers, parsley, cumin, chili powder, salt and cayenne pepper. Cook and stir 5 minutes, until well blended. Remove from heat and stir in cheese until it is thoroughly incorporated and melted. 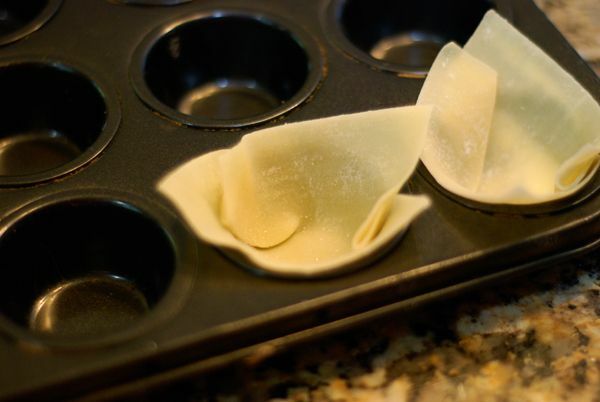 Line mini-muffin tins with wonton wrappers by pressing against sides and bottom to form small cups. 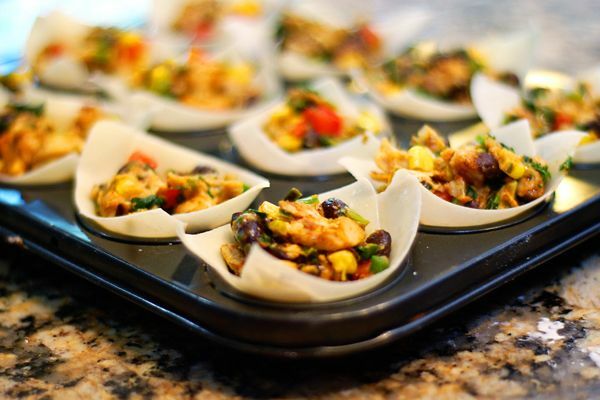 Fill each wrapper with a heaping tablespoon of filling. Bake at 400 degrees for 5 minutes. Top with cheese, if desired. Bake for 1 additional minute. Serve immediately. *If making from frozen, bake at 400 degrees for 8-10 minutes, or until filling in the center is heated through and outside is crispy. Oh my word! Those look so good! Those would be such a hit to take when you're to bring a snack or finger food. Thanks! I make those with a mixture of cream cheese, green onion, and cooked sausage. So yummy!! I had leftover filling last week. But since I had made them before, I bought an avacado, sliced it up, and spooned the filling over the avacado. Marc and I split it. It was delicious! This is a cute idea! I made the eggrolls the other day and they great! I told my mom about them and she made them the next day. 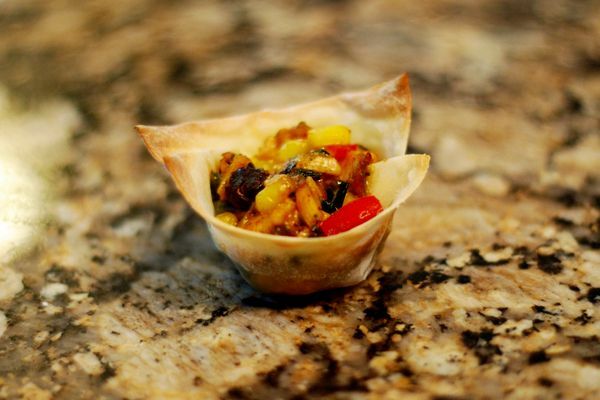 I will be trying them in the little wonton cups next. Thanks for the recipe! You're killing me!! When you posted the eggrolls, I looked in every single grocery store, with no luck, to find the wrappers. Now I'm going to go on the search again for wonton wrappers. These look great. I just may try them. Can you give me some idea to use this filling to make a pot pie, I would probably need to add some soup to it? ?